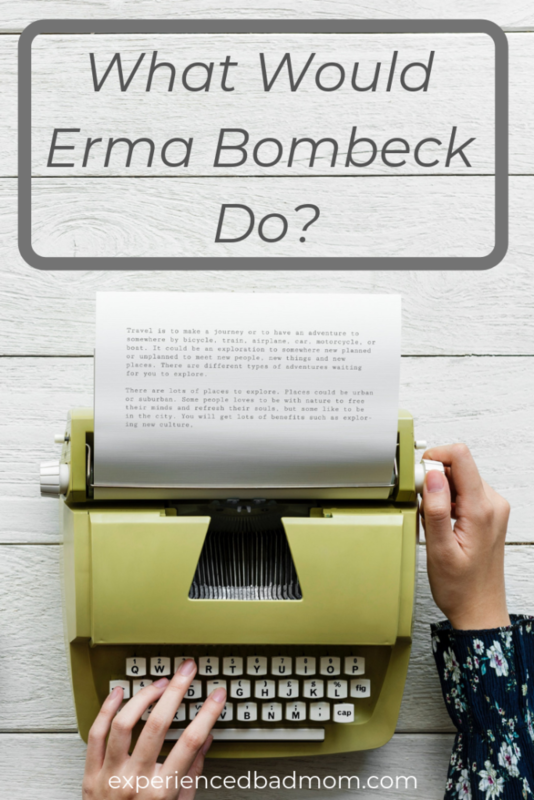 What Would Erma Bombeck Do? I found myself wondering what the great humorist Erma Bombeck would do if she were in my shoes recently. I had just published a humorous essay on the website Your Teen for Parents. It was a “small moment” essay, one that I wasn’t expecting to light the internet on fire, but one that I hoped would entertain other moms of teens. The magazine shared the essay on Facebook and people liked and reacted “Ha ha” to it. But others decided to share their negative comments. And I forgot that the first rule of Fight Club is you do not talk about Fight Club. Wait. That’s not right. The first rule of being a writer is NEVER READ THE COMMENTS. But I skimmed them when I was trying to archive the link. I found myself surprised. After all, my essay told the tale of the time I went shopping alone–and just happened to end up buying the exact same shoes my daughter already owned. It was funny! I hadn’t meant to buy the same pair so we could be twinsies, but I did. And she and I laughed about it and she told me I couldn’t wear them at the same time she wore hers. You know, probably like every teenage girl in the world? But the Facebook commentators found no humor in my humor. I needed to take back the reigns, they said. I needed to wear the shoes anyway because I was the mom, they said, and I had probably bought hers in the first place. Yeah, how dare I be kind and considerate to my daughter and NOT let her be a twin with her 40-something mom? Ya da ya da ya da. So what would Erma Bombeck do if she read criticism of her humor essays? Would the beloved humorist survive in today’s social media maelstrom? I’m not sure I know the answer, but I like to think she would laugh it off. Perhaps she would go hug her kids and tell them that kindness matters not only when you share a magical meme about kindness on social media. No, kindness matters as well in how you comment on the internet, too. And Erma definitely wouldn’t read the comments. Because the first rule of Fight Club, er, wait, the first rule of being a writer is NEVER READ THE COMMENTS. That’s what Erma would do. Oh good gravy. People had negative comments about this? I am glad you took the approach you did. Erma and I agree. I’m always surprised by how people can get up in arms about little things–and share their negativity! Katy recently posted…What Would Erma Bombeck Do? Nice people can become vicious on the internet. I don’t know why. I think your humorous story is delightful. I love Erma Bombeck and I do believe she would see humor even in the negative comments and keep writing like you. Good job! Ahh… some people are just TOO critical!! Especially MOMS!! I agree, sometimes it is best not to read the comments! LOL!